As such, a considerable advantage of this method is that the process can be applied to any given geometrical tessellation that meets edge to edge (albeit not all will be found to be suitable for motifs), in which the process of 's-curving' is purely mechanical, as no ‘creative thinking' at this stage is in order. (a) Take an existing tessellation consisting of geometric lines, of single or more tiles, of which the choice is easy to find in any one of a multiplicity of relevant books, or indeed a self designed one. As such, whether these are 'complex' (e.g. Penrose tiles) or 'simple' (e.g. any of the 13 Archimedean) is of no consequence for the method. (b) Denote the mid-points of each side of the polygon. 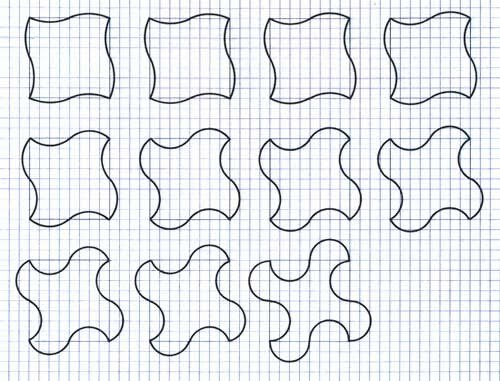 (c) 'Animate' the tessellation by the addition of a line (an arc) about the mid-point of the side, which then rotates 180°. Then continue by rotating this line around the polygon, .thus resulting in a ‘s-curved' unit. In effect, the line is thus 'convex and concave' in respect of the underlying polygon. 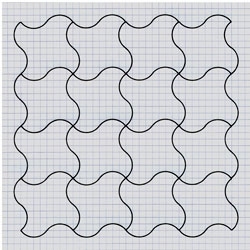 From this, the ‘convex and concave' process can then be continued throughout the tessellation. (d) Add bird (or fish) motif. This final stage is where 'imagination' comes in, of which most people are found to be wanting. However, with experience the ability to 'see' such motifs should improve, of which in due course a tiles suitability can be assessed immediately. 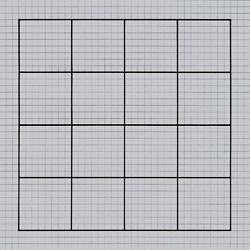 Taking a tessellation of arguably the most 'basic' of all, that of squares. Of note is that the strict regularity is not suggestive in any way of any motif. When so ‘s-curved' this immediately ‘animates' the tile, as it now of a more ‘lively' appearance, and therefore has potential for motifs. Consequently, it is then a matter of using ones imagination for a motif, of which this is suitable for a bird. Although the above takes a relatively short time to undertake, it is possible to do this even quicker, by simply not drawing out the diagrams in full. Upon having established that the original diagram tessellates, single tiles can be used instead. The diagram below shows the above four diagrams stripped down to the bare minimum, of which when the process is complete can then be shown as a definitive tessellation of the motif. Although the above has shown an s-curved example that is a success, a valid argument is that the degree of curvature for the arc has essentially been chosen at whim, an 'average' arc, neither too steep nor shallow. Obviously, there are others that could equally well be used, and perhaps of even better suitability or quality for a motif. Therefore, before producing a definitive tessellation at the end of stage (d) this matter should be investigated, as to neglect this would be otherwise unsystematic. 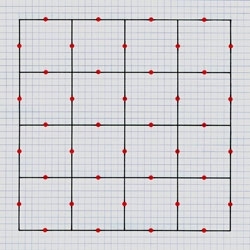 This is easily accomplished by drawing a series of arcs, ranging from 'shallow to steep' on individual tiles. The example here shows circle arcs of 50, 45, 40, 35, 30, 25, 24, 23, 22, 21 and 20mm, from a circle template. As can be seen, there is now greater choice in the selection of an ideal arc. To this is then added bird motifs. To save the essentially needless redrawing of the diagram, a photocopy of the outlines can be used. Although all are bird-like to lesser or greater degrees, some are of a better quality than others. Therefore, having thus examined a 'complete range' of all possibilities, the best one can then be selected for the definitive drawing. Of note here is that of the possibility of showing all these as finished tessellations, i.e. as of eleven tessellations. 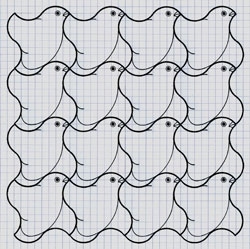 Although this is indeed possible, and thereby adding to ones own number of tessellations, to try and 'outscore' other people in this way is to be regarded as 'sharp practice', as the tessellations are very much alike, and so should not be regarded as of inherently different from each other.